The love that you and your special someone share is far from static. So, why not give your Valentine a piece that shimmers with a rainbow of hues and adapts to any situation? Opal jewelry displays a gemstone unlike any other; when this unique gem is paired with the symbol of love, it’s especially fitting for Valentine’s Day. While most gemstone sparkle, the opal has an iridescent look that gently shimmers with a range of hues. This mesmerizing appearance has intrigued for thousands of years, but the cause of this one-of-a-kind look wasn’t discovered until the 1960s. Scientists in Australia found that tiny spheres of hydrated silica are suspended in water within the opal, and these particles act as prisms that separate light into the array of colors that comprise it. However, knowing the source behind the opal’s shimmering beauty doesn’t take away from its slightly mysterious appeal, rendering this gem an excellent pick for the one who keeps you on your toes—especially when this stone is surrounded by a romantic setting. 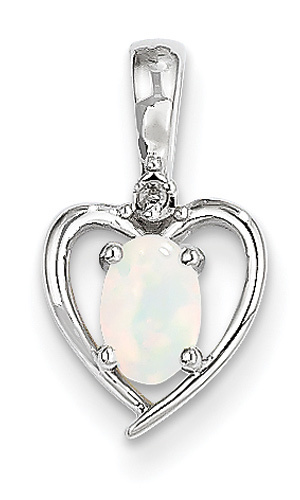 The Opal and Diamond Heart Pendant in 14K White Gold embraces a teardrop-shaped opal, nearly a half carat in weight, in the center of a gleaming heart of 14K white gold. Three small accent diamonds glitter from the ribbon-like swirls of white gold that hug the center stone and connect it to the simple polished bale. This is a piece with enduring grace, one that she’ll be able to wear for years to come. 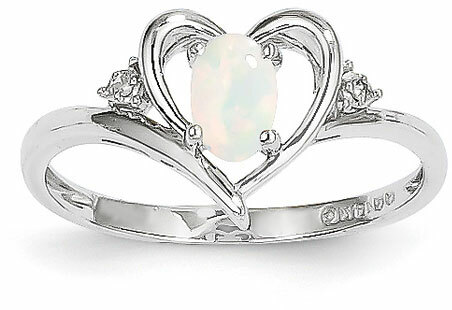 If you’d rather give your Valentine a piece of opal heart jewelry for her finger, try the Genuine Opal Heart Ring in 14K White Gold, which showcases a 6mm-high opal-shaped opal. This shimmering gem seems to fill the center of the gleaming heart that sweeps around it. Small diamonds accent each side of this elegant heart and add a touch of sparkle to complement the iridescent look of the opal. 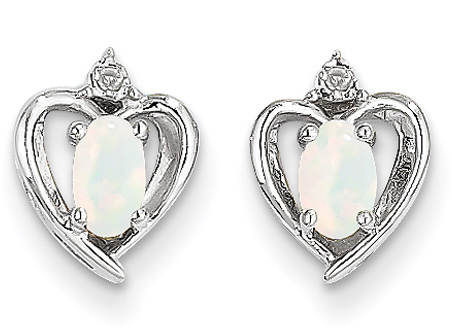 The Opal Heart Earrings in 14K White Gold showcase a similar style, with a pair of 5mm-high oval-shaped ovals in the centers of polished white gold hearts. A diamond is nestled into the top of each heart to help draw eyes to the wearer’s ears. This pair would be lovely on its own or coupled with the matching Real Opal Heart Pendant in 14K White Gold. 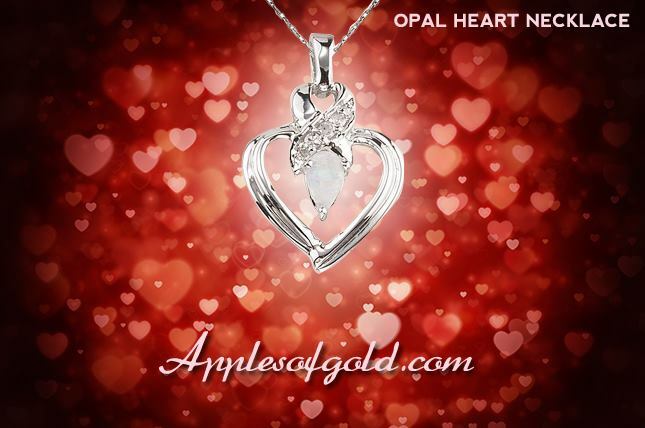 For the one who makes your heart shimmer, why not go with a piece of opal heart jewelry?